As civilians continue to die in Aleppo, the Security Council has resorted to debate the fairness of reports of the humanitarian situation in the city, as the Russian veto blocks substantive actions. Meanwhile, member states are looking to the General Assembly for a possible way around the Security Council deadlock. 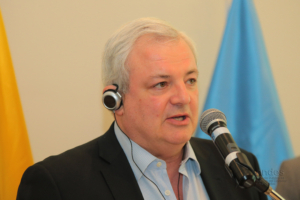 “Our generation’s shame” – that is how the UN humanitarian chief, Stephen O’Brien, described the Security Council’s inability to act on the humanitarian disaster in today’s Aleppo. During a meeting in New York, O’Brien criticized representative envoys from the Security Council’s member states. He stressed that Aleppo has become a “kill zone”, and the critique was indeed blistering: “If you don’t take action, there will be no Syrian peoples or Syria to save – that will be this council’s legacy, our generation’s shame”. O’Brien’s attack on the Security Council’s inability to act, and the bombings conducted by Russia and the Syrian regime, failed to spark action, but instead led to more debate and squabbling among the council’s two main camps; Russia and China on one side, and France, the United Kingdom and the United States on the other. The Russian ambassador, Vitaly Churkin, stated that O’Brien’s report was “unfair and dishonest”, something which caused great debate between the other ambassadors. Subsequently, the debate concerned Russian-led bombings of Aleppo, and its unwillingness to submit to negotiations in the Security Council. The Russians were criticized for its “attack on the UN”, and all negotiations stalled. Once again, the Security Council failed, despite harsh internal criticism, to act at all. Instead they plunged into squabbling over the report by O’Brien. While the Security Council remains deadlocked, many United Nations member states have called for the General Assembly to hold an emergency special session to take action. An informal meeting to discuss the Syrian situation was held on the initiative of Canada and 70 other member states on the 20th of October. Whether an emergency special session will be convened in the near future, and whether it can lead to substantive action, remains to be seen. Meanwhile, the death tolls in Aleppo continue to increase, and civilians continue to suffer as a result of the Security Council’s veto-induced inaction.